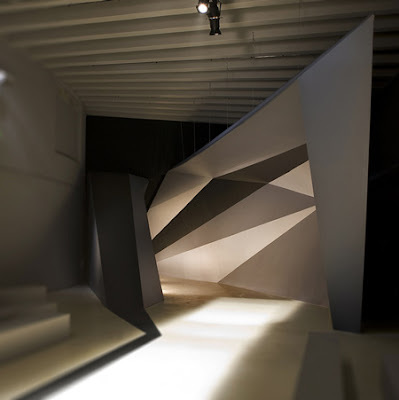 One of my favorite arcitects Zaha Hadid is one interesting thinker. Her designs are out there and most people cant understand them but I sure do. My mother thinks she also is very interesting but I'm not so sure she loves her buildings. She is well known to any designer or architect but to others not so much. However that shall soon be changing. She being based in London has pretty much designed the entire olympic city for the London 2012 olympics. 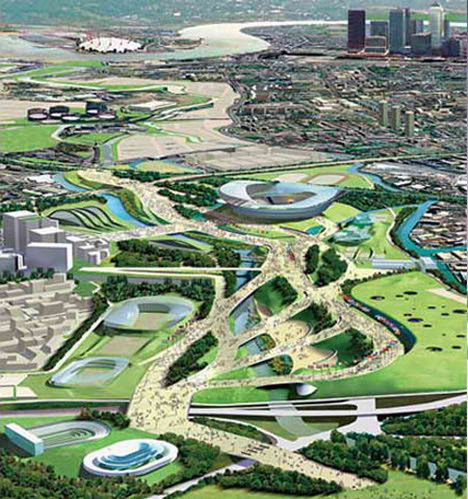 The olympic city is designed after the blood system of the human body and the buildings encorproate right into the earth. I just know for a fact once the olympics come around the architecture is going to be talked about so much just like the 2008 olympics. Another one of my favorite projects by her, and probably her most well known project is the ROSENTHAL CENTER FOR CONTEMPORARY ART MUSEUM. Located in Cincinati, Ohio the building is amazing from the outside in. The six-story 87,000 square-foot Center features 17,000 square feet of gallery space, the UnMuseum (a children's education center for participatory art installations, hands-on projects and other programs) and a 150-seat performance space, a bookstore, cafŽ kiosk and office facilities. 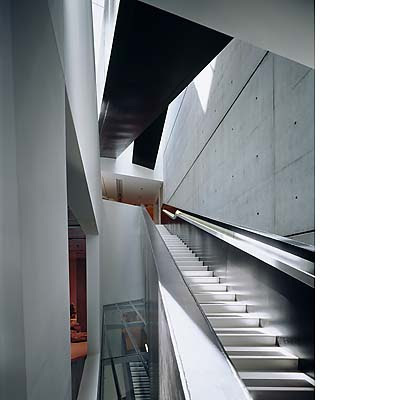 The concrete, steel and glass building features undulating levels and ramps to accommodate the varied shapes, scales and media of contemporary art. The galleries, that appear to float over the main lobby, connect and interlock like a three dimensional jigsaw puzzle, allowing for unobstructed viewing from all sides. "The public lobby, where everyone enters, is downtown and central to the city so people who are just walking around can go in and have a coffee downstairs or hang around the lobby or go upstairs to quickly see a show. It is a very accessible building. It's not a compact building and there is a degree of transparency on the ground and above. So it's not only how we use it, but also how we pass through it. Every time you confront the space you have a different experience". 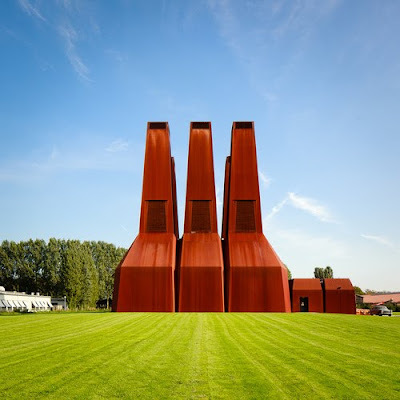 Here is her profile off of Arcspace.com a GREAT architecture website, I check it out more then once a day. Zaha Hadid is a London-based Architectural Designer, whose work encompasses all fields of design, ranging from urban scale through to products, interiors and furniture. Central to her concerns is a simultaneous engagement in practice, teaching and research, in the pursuit of an uncompromising commitment to modernism. Hadid studied architecture at the Architectural Association from 1972 and was awarded the Diploma Prize in 1977. She then became a partner of the Office for Metropolitan Architecture; began teaching at the AA with OMA collaborators Rem Koolhaas and Elia Zenghelis; and later led her own studio at the AA until 1987. Since then she held the Kenzo Tange Chair at the Graduate School of Design, Harvard University, the Sullivan Chair at the University of Chicago School of Architecture, guest professorships at the Hochschule für Bildende Künste in Hamburg, the Knolton School of Architecture, Ohio and at the Masters Studio at Columbia University, New York. She will be the Eero Saarinen Visiting Professor of Architectural Design for the Spring Semester 2002 at Yale University, New Haven, Connecticut. In addition, she was made Honorary Member of the American Academy of Arts and Letters and Fellow of the American Institute of Architecture, and is Professor at the University of Applied Arts, Vienna. (1999) and the Bergisel Ski-jump in Innsbruck, Austria (1999). Below is a Video of some of her other work. Definitly worth checking out. Or just looking her up more to see more of her work. Interesting designer, interesting thinker.